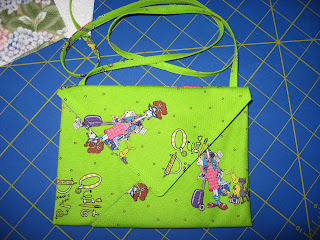 This lime green Quilt Diva bag measures about 6 1/2" x 4 3/4". 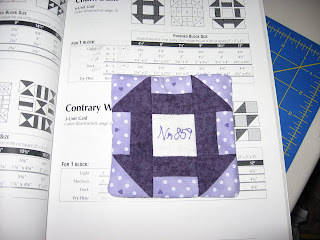 I just finished it to wear to the Quilters Heritage Celebration this weekend. The Purple Churn Dash pin is for Nan to wear when she meets us there. While we were eating breakfast last Friday, she was able to book a load on Wednesday from Catonment, FL to Camp Hill, PA on Friday. Then she's coming to Lancaster to meet us for the quilt show. It's her first show. Now for a short nap and then off to Vestal early tonight to honor Connie, the retiring Town Clerk from Vestal. I first met Connie in 1975 when she was running for office for the first time. She and I were among the founders, along with the late Margaret Lamoreau of the NYS Town Clerks Association. We spent many hours folding flyers, typing mailing labels and traveling around the state to convince other town clerks that we needed to organize ourselves so we could better serve the people of our town. I served 29 years and Connie has served 30 years. JoAnne from Nanticoke has been town clerk for longer than us. Town Clerks put it in the minutes. Speaking of minutes, I really wasn't born taking minutes of the delivery, as someone once said but I started as secretary of organizations during high school. During the years when I worked at Lander Company in Binghamton, now closed, I was the union secretary and later president. Now I'm secretary of both Triangle Guild and Chenango Piecemakers.